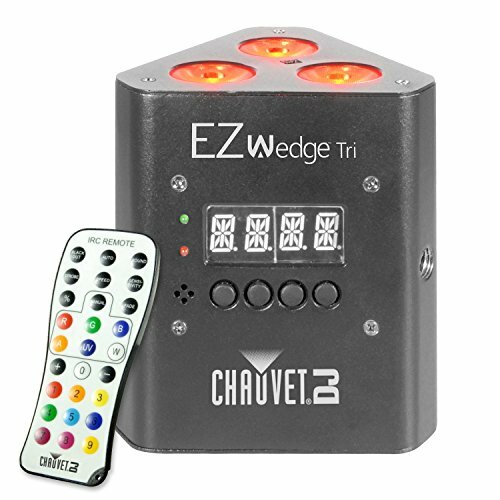 The Chauvet EZWedge Tri is a battery-operated, tri-color LED wash light that fits perfectly inside TRUSST Goal Post and Arch Kit truss systems. The rechargeable, lithium battery lasts up to 20 hours, and you can easily check the battery status. The EZWedge Tri attaches to 35-mm truss without the need for a bracket. Its flicker-free operation is suitable for on-camera use and it provides smooth dimming with built-in dimming curves. Easily control static colors and automated programs with the included IRC-6 remote, or create any color w/o DMX by using the built-in digital display.